An aerial view of the collapsed Jamiul Jamaah mosque where rescue workers and soldiers search for earthquake victims in Pemenang, North Lombok, Indonesia, Aug. 8, 2018. 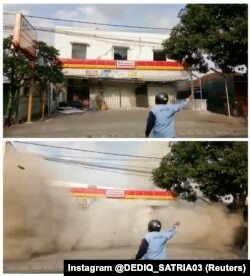 A combo picture shows a man directing people away from the building during the collapse due to an earthquake, Indonesia August 9, 2018 in these still images taken from a video obtained from social media. A wooden house in Prawira Village, North Lombok, still intact after the quake. Indonesian construction experts like Yulianto Prihatmaji, who earned his doctorate in engineering from Kyoto University, Japan, and currently teaching at Islamic University of Indonesia, Yogyakarta, agree. Haji Fuadzi, resident of Pemenang County, North Lombok, holding up his land deed he found in the rubble of his concrete house. Prihatmaji pointed out that traditional Lombok wooden houses are small, limited by the length and span of the natural materials used in their construction. He added that the houses can be dismantled easily because the people of Lombok were once nomads, moving often in their search for farmland. 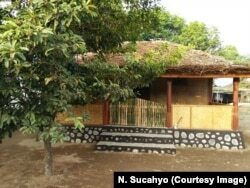 He criticized the move to concrete construction by local people who perceive the wooden houses as outdated and shabby. “When the shift to concrete buildings happened, they prioritized the appearance of the building, not the structural strength,” Prihatmaji said. A village with traditional wooden houses in Limbungan Village, East Lombok. “It’s our duty to learn more about carpentry, natural materials and local culture,” he said. “Experiences in the past can be the answers for the future. For example, in the past, houses were smaller. So it would be wise to return to wooden houses in the future.